Thought leaders impart wisdom about creating lives that are works of art, embracing the heart and mind. Rather than celebrate materialism and the vapid drive for more wealth, we are creating an anthology of compelling narratives that seek to ascertain what constitutes a meaningful life, not just a successful one. You will receive a wealth of knowledge! Discover what it truly means to be a leader in an age in which conformity is emphasized and risk is avoided. An entrepreneur’s hard-won victories contain the full human drama: adversity, conflict, struggle, triumph, failure, and redemption. Discover how to fast track your life at a young age - at any age by learning what to do and what not to do! So many young people are programmed from an early age to go to school, get good grades, attend college, and then hope for a good-paying job. This used to be the “safe” approach to obtaining a successful life. But every once in awhile, a maverick like Mark Zuckerberg, comes along and bucks the trend. This person doesn’t play it safe. Instead, they take risks. Perhaps they drop out of school. They put their heart and soul into building a company that has never existed before, offering a crucial product or service that no one else is providing. By doing something so disruptive and wholly original, they attain success on their terms. As a culture we celebrate these gutsy individualists as entrepreneurs. Proceeds of the Skip-A-Step books will go to Teen Entrepreneur Academy. When being an entrepreneur isn’t a choice in life but a necessity, Skip a Step will help open your mind’s eye to the world of business and the future obstacles that await you on your journey, including how you can counteract and overcome them with swiftness, style and grace. While thousands of books have been written on adult entrepreneurship, very few have been made to assist our young inspiring leaders who are trapped solely by the constraints of time. 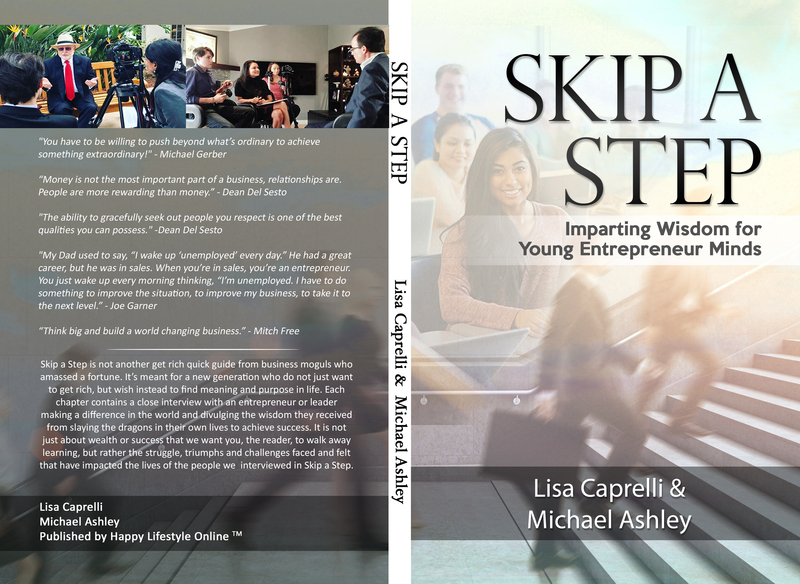 Thankfully, authors Lisa Caprelli and Michael Ashley composed this book rich in information for such a purpose, containing decades of entrepreneurial experiences that strengthen the skin and sharpen the mind with each page absorbed; each sentence serving as a word of advice to our inspirational generation to develop the right attitude for success in all its forms – wealth, health, and relationships. By tuning in to the identify of your true social purpose, Skip a Step shows you what your personal meaning of success should look like through establishing a firm definition of what it is that you want to be known for when everything is said and done. Yes, the younger generation always has more time than anyone else on this Earth but by defining your true social purpose today, Skip a Step can show you how to make every day that much more meaningful. More importantly to becoming socially viral, this book will help guide you towards properly supporting others so that, in turn, you can become more of a person whom people would want to support going further. Skip a Step will help you confront the brutal truth of any worst-case scenario, be it terminal illness, a split-up, moving to a new place, financial struggles, or identity issues. By achieving self-discovery through personal trials, this book will show you how to obtain essential lessons from hardships instead of drowning in them. Life is challenging. Dare to change the circumstances you don’t like. Dare to leave those bad situations behind where your talents are heavily criticized rather than cherished. 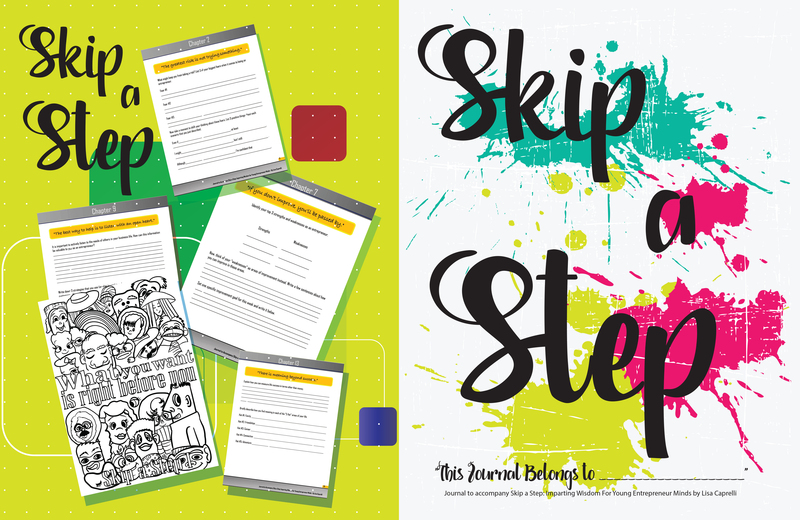 Skip a Step offers unmatched advice on how to make the most from seemingly nothing by fueling your creative drive and monetizing your adventurous spirit. Always be innovative, flexible, and realistic with your time while understanding the crucialness of effective communication. By offering guidance through tips for job interviews and proper goal-setting, Skip a Step is here to help you stay close to your mission when those unavoidable tough times get you down. Prepare yourself on how to tackle life’s daily challenges by making sure your future looks bright. Time spent learning is time not wasted. Through emphasizing self-reflection and coming to understand the experiences of others who have succeeded despite turbulent times, Skip a Step demonstrates the necessity of having felt suffering, the lessons that can be learned from struggle, and how to develop the confidence needed to choose not to feel either anymore. By helping young leaders decide which business shoe to put on to get them the farthest, Skip a Step foretells how our upcoming generations can be most resilient and far-reaching of all time.